This set of Biochemistry Questions and Answers for Freshers focuses on “Buffering against pH changes in Biological Systems”. 1. Which can act as buffer? Explanation: It is a mixture of weak acid and its salt with strong base. 2. Calculate the pH of a mixture of 0.10M acetic acid and 0.20M sodium acetate. The pKa of acetic acid is 4.76. 3. Calculate the pKa of lactic acid, given that when the concentration of lactic acid is 0.010M and the concentration of lactate is 0.087M, the pH is 4.80. 4. Calculate the ratio of the concentrations of acetate and acetic acid required in a buffer system of pH 5.30. [acetate]/ [acetic acid] = antilog 0.54 = 3.5. 5. Assertion A: pH of a buffer solution solution does not change on dilution. Reason R: On dilution the ration of concentration of salt and acid (or base) remains unchanged. Explanation: On dilution pH of buffer solution remains unchanged because the ratio of concentration of salt and acid (or base) remains unchanged. 6. Which of the following mixture in aqueous solution of equimolar concentration acts as a buffer solution? So the mixture contains NH4 OH + NH4 Cl. Explanation: An acid buffer is a mixture of weak acid and its salt with strong base, its pH increases by increasing the concentration of salt. Explanation: Buffer capacity = number of moles of acid or base added to 1 liter of buffer/change in pH. Explanation: Buffer has more capacity when pH = pKa. 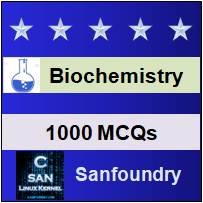 To practice all areas of Biochemistry for Freshers, here is complete set of 1000+ Multiple Choice Questions and Answers.